During the summer months, I sleep with my curtains and windows open. After the day’s humid heat, the nighttime breeze is soothingly welcome. But it is the monsoon storms that mesmerize and bring the night to life. Sometimes they last for hours, a pillaging army slowly marching across the high mountain tops into the Kathmandu Valley. I see it first. Icy and blue, the sheet lightning soundlessly outlines the hills, dark layered spines and humps that spread west and north from my bed’s vantage point. The thunder takes its time. Long rolling grumbles ricochet from hill to hill reminding me of childhood tales of grumpy, unruly giants. The rain, like a Diva arriving appropriately late, can pound with brutal force or just steadfastly descend unbroken for hours. When the rains come, Kathmandu becomes a city of mud roads — thick, slithering mud – and large lakes of water where road construction crews somehow omitted to include drainage ditches. It’s the season when I stick to flip-flops or rubber boots. When I walk my dog in the open fields, I carry salt to eradicate the leeches that latch on to both of us. The streets are umbrella jams not only for the downpours but also for the searing sun that alternates with them. My vote for monsoon fashion statement is the Siamese twin rain poncho with two slits for the heads of both the motorcycle driver and passenger, worn by tens of thousands of motorcyclists. If you live at the whim of the monsoon’s power, the rains become, in big and small ways, an obsession. They are talked about for months before they come, hitting this part of the Himalayas in June and sticking around into September or even October. The BBC News weather reporter talks in exotic terms such as “monsoon troughs” and frequently warns of landslides. 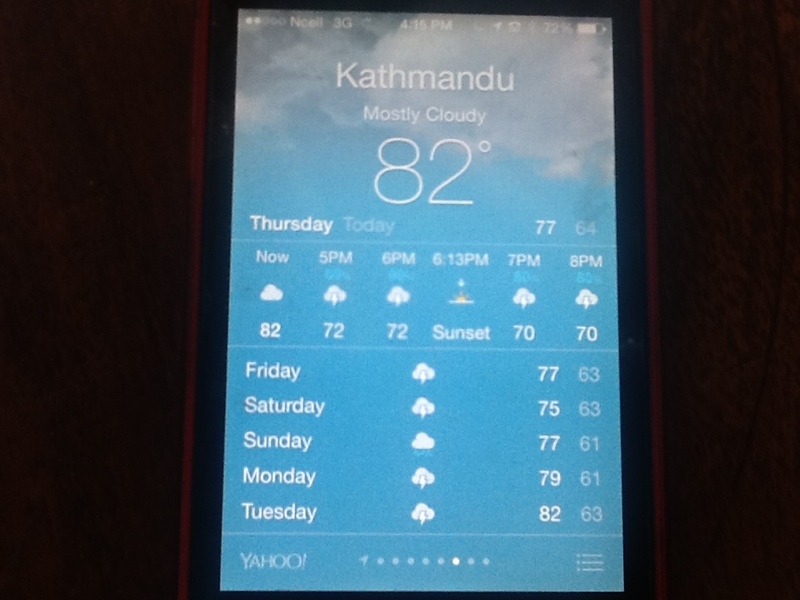 My iPhone forecast has a sole icon for all three months in Kathmandu even if there are long stretches of sunshine: a grey cloud with a thunderbolt through it. The monsoon has a different meaning depending on what you do and where you live. For the farmers that constitute a majority of Nepal’s population, it’s flooding rice fields and growing wheat, barley, potatoes and putting food on the table. For the four million people in the water-starved Kathmandu Valley, it means the bore-holes and the wells are being replenished. In smog-choked Kathmandu, the rains settle the dust and wash the trees and break the Valley into a palette of so many vibrant greens that even Martha Stewart would be challenged to give them names. 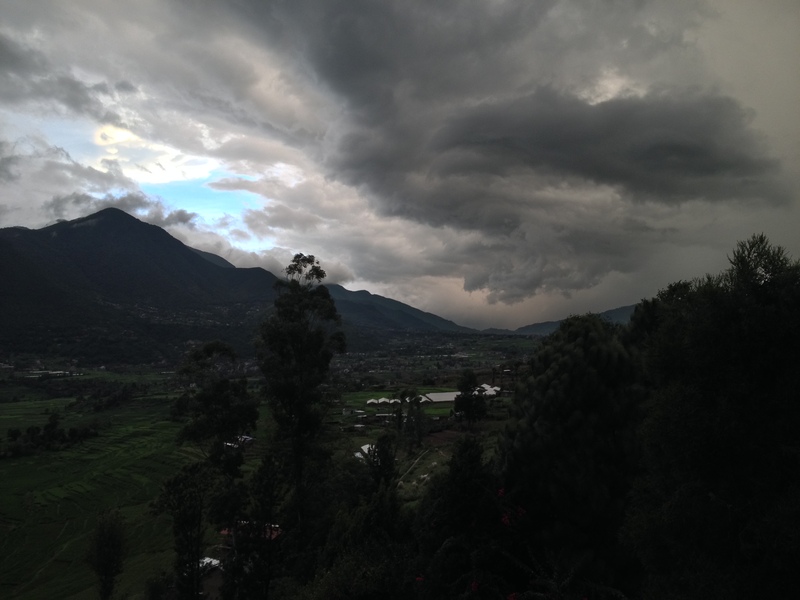 Nepal’s rains are a bonanza for the entire region. Deep snows and heavy rains feed the rivers that flow into India and Bangladesh, where hundreds of million people live. The water powers Nepal’s hydroelectric power plants, and during a few wet months our power cuts shrink from 18 to a mere 5 hours a day. 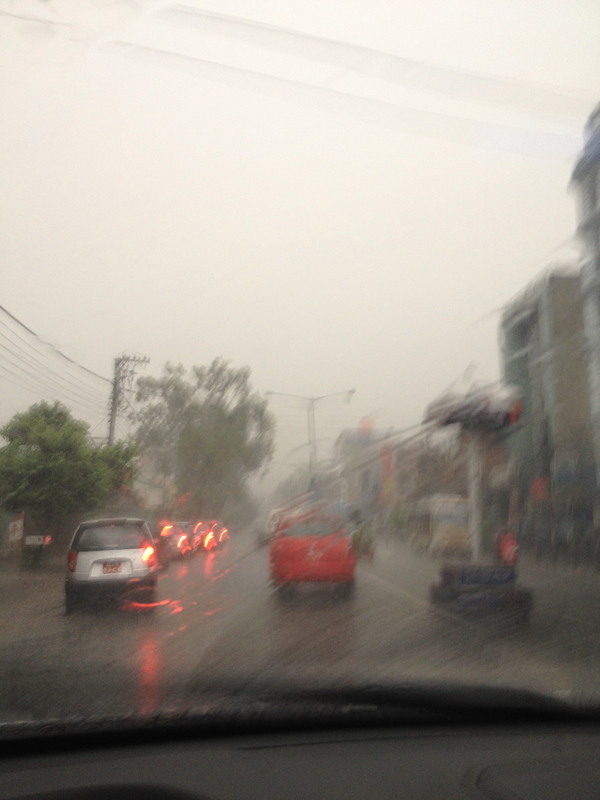 Last week in Kathmandu, 71 mm of rain was recorded in 24 hours. Without warning, the Dhobi Kola that traverses the city, fed also by rains upstream, turned into a raging torrent, tearing over riverbanks and flooding houses. 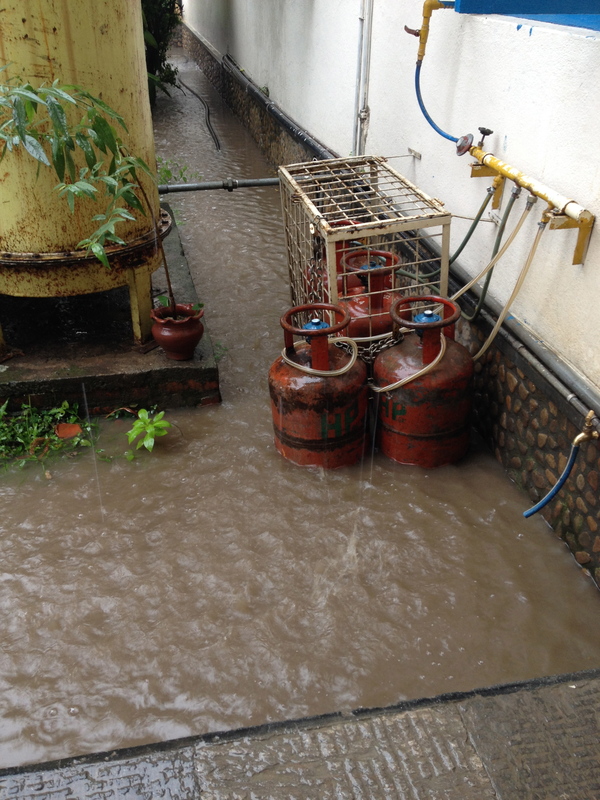 This monsoon was one of the most severe in years. Nepal’s powerful rivers flooded huge tracts of land in the Terai, on the border with India, killing hundreds and rendering thousands of Nepalis homeless. Nepal, a land of steep mountains where roads are precariously carved out of their perpendicular flanks and villages huddle near rivers, is plagued by massive landslides that wipe away roads and swallow entire villages. In the middle of the night on August 2nd this year, near the Chinese border in the northeast, an entire mountainside cleaved off and brought down tons of boulders and mud, burying a village and killing more than 160 people and their livestock. Loss of life aside, its economic impact is still being felt two months later. The mudslide blocked a large river, creating an impromptu lake that flooded a hydroelectric plant and threatened to flood villages downstream as far south as India. It also buried the only paved road to China, a vital trade link that has now been severed. To keep a bit of trade alive, porters now ferry trade goods on their backs across the unstable landslide. Savior. Destroyer. The monsoon does not like to be ignored. 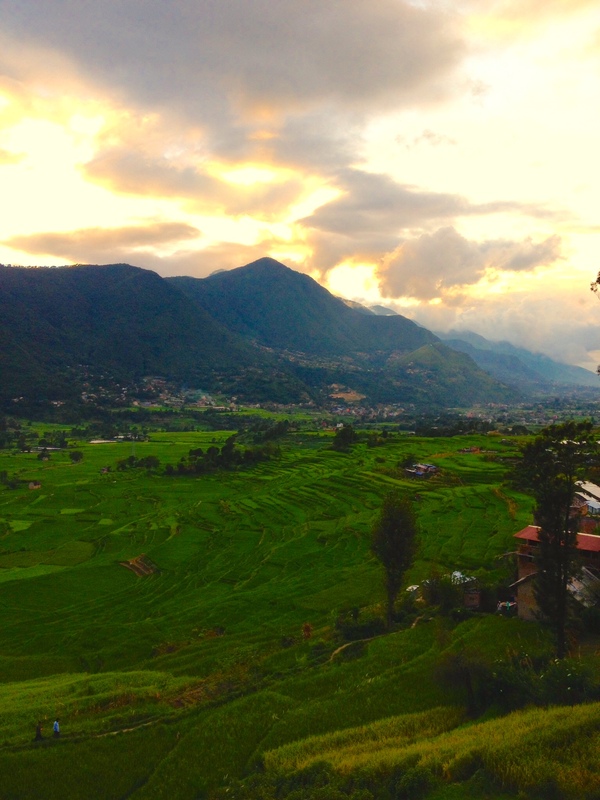 It is Nepal’s most vibrant and intensely beautiful season. 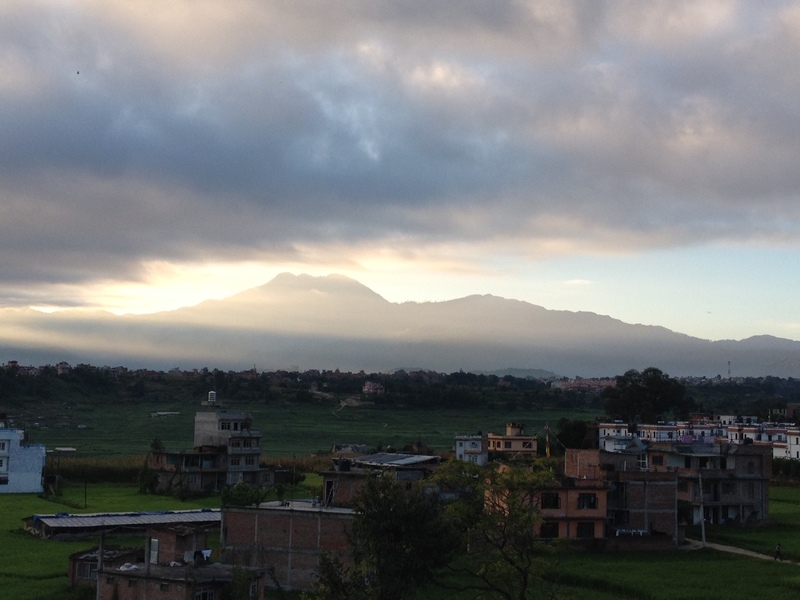 The clouds alone speak their own language, sometimes burying the city or constantly moving, grey and white, wisps that cling to the mountain sides or hover over the Bagmati River in the pre-dawn, slowly rising to drape the mountain tops. During the day, they turn angry, thicker, layered, yet often opening up to share with sharp sunlight and blue sky. It can pour in one part of the city and be brilliant sunshine in another, less than half a mile away. Wind shear and lightning make it a treacherous time of year to fly, and planes are frequently delayed and occasionally rerouted. I love my hills. They are forever moving and shifting with the light. 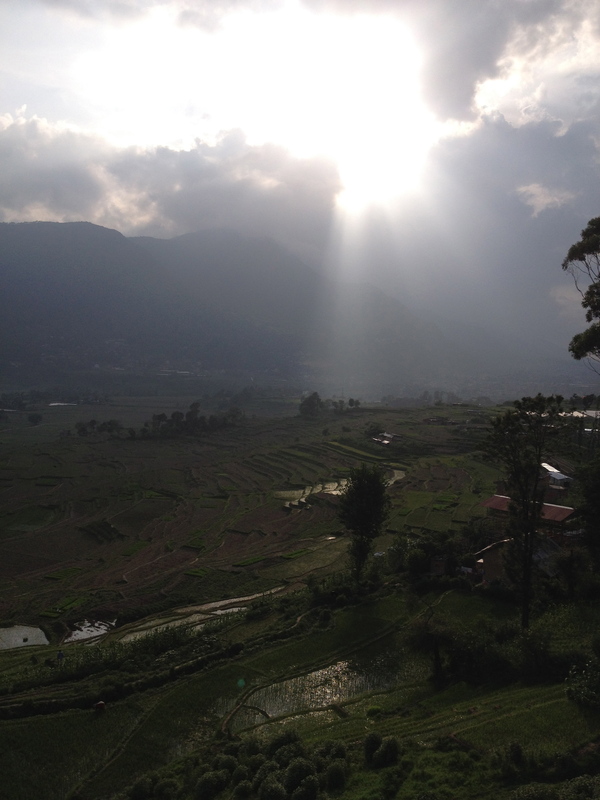 Just before sunset, I stand watch over an amphitheater of terraced emerald rice paddies. Flocks of long-necked brilliant white egrets float in long lines caught between the darkening mountains and the paddies, too far for me to hear them. Sunsets are never the same. Clouds move, slow motion avalanches around the mountain peaks, mixing greys, blues, whites, reds. I hear the comforting sound of a plane overhead. The sky is cooperating with Kathmandu tonight. 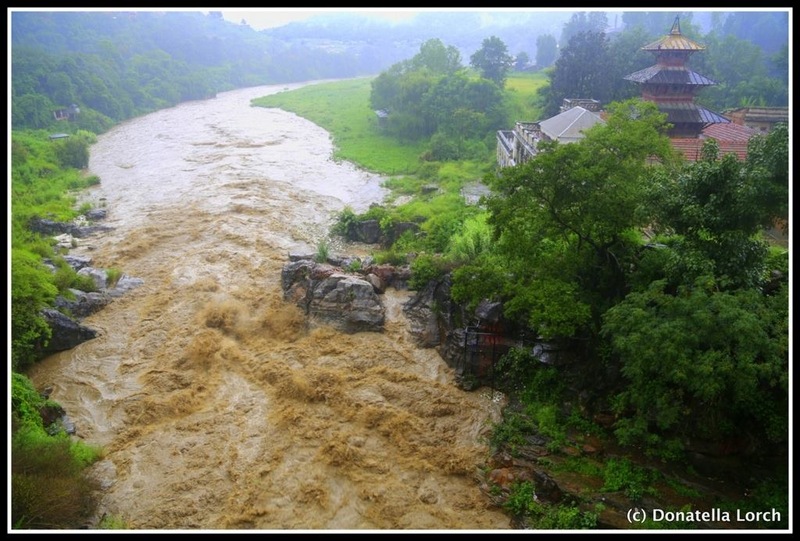 This entry was posted in beauty, donatella lorch, floods, landslides, living overseas, monsoon, Nepal, south asia and tagged bangladesh, beauty, floods, himalayas, hydropower, India, landslides, monsoon, Nepal, rain, south asia on September 23, 2014 by Donatella Lorch.